Wednesday’s Supreme Court judgment (press summary here) in the Catt case marks a missed opportunity to protect the privacy rights of protestors and instead waves through the police’s runaway mass surveillance operations. By a 4:1 majority the Court allowed the Met’s appeal against the 2013 Court of Appeal decision which had said that the retention of intelligence records on John Catt (a veteran peace protestor suspected of no criminal activity) on the National Domestic Extremism Database breached his privacy rights under Article 8 of the European Convention on Human Rights. The Supreme Court unanimously rejected the Met’s arguments that the records did not engage or interfere with privacy rights at all, and instead agreed with jurisprudence from the European Court that privacy will be interfered with wherever there is a systematic retention of information, even when that information is publicly available. However the majority deemed the interference to be in accordance with the law and proportionate. In reality we know that protestors are hounded and intimidated by FIT officers. Many have reported being goaded by officers with personal information that they know about them such as their names and where they live. Others have had photographers following them continuously for hours on end as they go about their day to day business. It is difficult to see how these tactics could not be considered intrusive. It is also public knowledge that police officers from NETCU (a sister-unit of the NPOIU, itself a predecessor of the NDEDIU which now manages the Domestic Extremism Database) colluded with the Consulting Association to create a blacklist of construction workers who were categorically and deliberately denied work due to their involvement in trade unions. This is a very real example of how police information can be (and in fact was) disclosed to others without regard for the law and with disastrous consequences for those concerned. Late last year it also emerged that the parents of a student activist were contacted by police officers involved in the ‘Prevent’ programme, apparently because they had concerns he was becoming involved in domestic extremism. It is not unreasonable to suggest that it is only a matter of time before we see the intelligence on protestors being ‘put to full use’ by police; this is a bleak prospect in an age in which dissent continues to be attacked by the state from all fronts. Lord Sumption also rejected the notion that the database was a ‘secret’ one, simply on the grounds that the retention of information on it is subject to the publicly available MoPI Code of Practice and guidance, and that anyone can request data held on them via subject access request under the Data Protection Act. In reality the MoPI code and guidance make absolutely no reference to the database specifically- they provide general guidance on the management of police information obtained in a huge range of circumstances- so quite how they offer any clues as to the existence of the database is unclear. 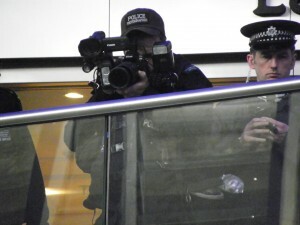 Furthermore, Netpol has found and reported that police are obstructive and more often than not fail to comply with subject access requests, so the DPA can hardly be said to provide ‘robust oversight’. He also uses the somewhat circular argument that the “existence of specialised police units dealing with political demonstrations which are thought liable to degenerate into criminality is widely known” and “has never been concealed from those who wish to know”. If the existence of the database can be said to be ‘widely known’ today (and that is in itself debatable) it is only through the efforts of determined investigative journalism, and a handful of high-profile legal actions against the police (including this one). Even if there is no official policy of secrecy around the database, the police have certainly made efforts to hide its existence– for example during Wood v MPC (the first case which challenged the activities of Forward Intelligence Teams) police initially submitted to the Court that there was no database of individuals which could be searched through by name. However midway through proceedings an article was published in the Guardian proved this to be false, forcing the police to change their official position. The inevitable conclusion from all of this is that the police simply cannot be trusted to operate in the manner in which they claim. Yet the Supreme Court decision ignores this. Lord Toulson in the sole dissenting opinion found the interference with the right to privacy to be disproportionate. He pointed out that whilst most of the records related to Mr. Catt’s attendance at ‘Smash EDO’ protests, many were taken at comparatively innocuous events such as a TUC conference– and asserted that the police had offered no explanation as to why it was necessary or proportionate to hold those records. John Catt has indicated that he will take the case to the European Court of Human Rights – historically the court has been far stricter on the requirement of accordance with the law and therefore far less willing to allow the state wide discretionary powers where privacy and surveillance are concerned, resulting in a series of rulings against the UK – see Malone v UK (1984), Hewitt v UK (1992), Liberty & Others v UK (2008), S & Marper (2009) (though a notable exception is Kennedy v UK (2010) in which, rather like in this case, the Court took the State’s assertions about oversight and regulation at face value, ignoring the reality.) It will be several years before the case reaches the court but perhaps finally then will there be meaningful safeguards against indiscriminate mass surveillance of political activists. Until then it is very possible that activists will see a marked increase in forward intelligence and evidence gatherer teams at protests. Defend the Right to Protest will be holding a briefing on this issue – date to be announced shortly.